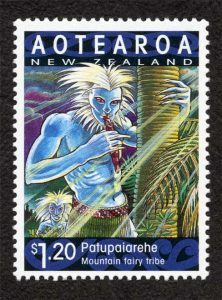 In Māori tradition patupaiarehe, also known as tūrehu and pakepakehā, were fairy-like creatures of the forests and mountain tops. Although they had some human attributes, patupaiarehe were regarded not as people but as supernatural beings. Patupaiarehe were generally found deep in the forests, or on mist-covered hilltops. In these isolated places they settled and built their homes, sometimes described as forts. In some stories their houses and pa were built from swirling mist. In others, they were made from kareao (supplejack vine). Matthew Tyler: What is your view on the theory that ghosts are made of, and draw upon, energy? Do you feel this is valid or plausible?